London’s mayor Boris Johnson wants to see a “cycling revolution” in his town. But transport transformation requires more than a bright coat of paint. While idealistic urbanists plot ways to turn 10-lane freeways into wilderness corridors, London is rolling out brand new superhighways. But these are not the pollution-spewing variety. A series of 5-foot-wide, bright blue bicycle lanes are opening across the city this summer in an effort to improve safety and efficiency for pedaling commuters. A dozen cycling superhighway routes (initiated by the mayor but sponsored in name by Barclays) are slated to open in the next five years, eventually forming continuous spokes connecting to the center of London from all directions. With cities like Berlin and Amsterdam as models, London aspires to be a model of pedal-powered transport, adding not only the new lanes but also city-wide bike-sharing (a strategy that is so far a success in Denver) as well as more bike parking. 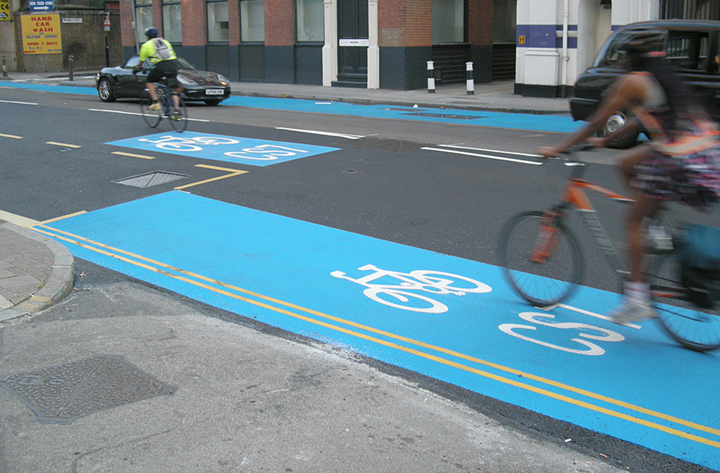 Unfortunately, as the BBC reported in the first days of superhighway action, you can also expect to find cars, trucks, and busses in the blue lane. While the bright color and textured surface are designed to deter drivers (or at least heighten their awareness), it seems that more innovative measures are needed. The London Cycling Campaign is asking for speed limit reductions and lanes designed to avoid major, car-filled intersections altogether. The demand for more radical urban design overhauls calls to mind the woonerf strategy, originally implemented in the Netherlands but now jumping to Germany, the UK, and even Somerville, MA. 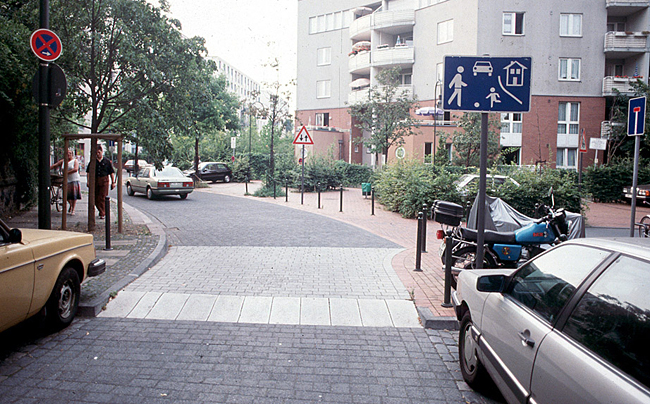 Woonerf blurs sidewalk and street, and does away with the idea that automobiles have priority of the road. Of course, in London this approach would become a traffic nightmare in many places, but by strategically changing the transport hierarchy, it might be possible to achieve the “cycling revolution” that the mayor aims to incite. Woonerf photo by Dan Burden.